SKU: 011. Category: Single Rider. 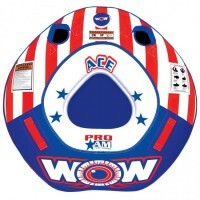 Just about everything you’ll need for a super fun day on the water is in the box! 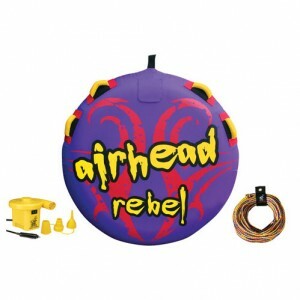 REBEL is a 1 rider 54 inch diameter deck tube with 4 deluxe handles and neoprene knuckle guards. It’s equipped with a Boston valve for your inflating and deflating convenience. 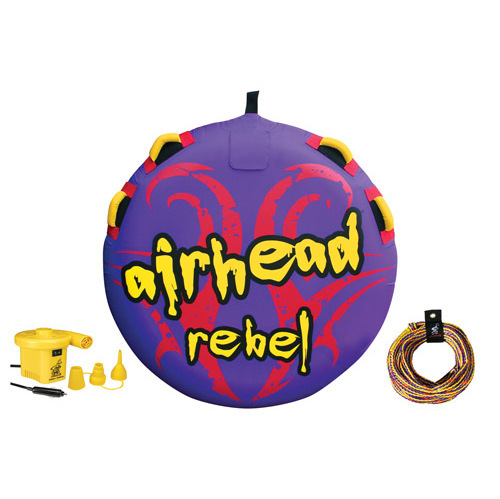 The heavy gauge PVC bladder is fully covered by rugged double-stitched nylon. 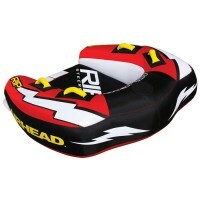 Features include a triple reinforced tow harness, drain vents and boarding straps. 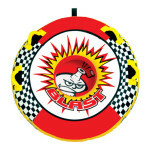 Our best 12 volt pump is included and will inflate REBEL quickly and effectively. A color-matched 16 strand tube tow rope is also included.